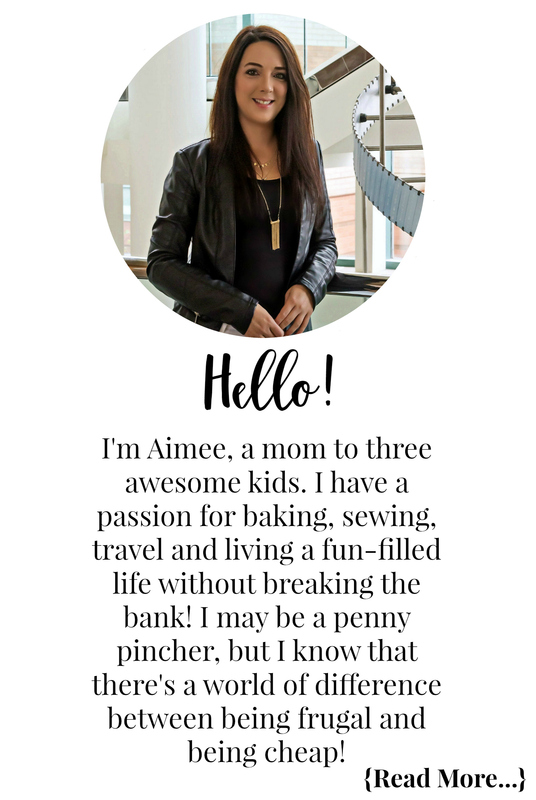 Since becoming a mother, I can certainly say that I’ve bought my fair share of toys and gadgets. Although I have bought what seems like an endless supply of play things for my kids, I’m by no means a toy buying expert. When I first became a mom I thought it would be a piece of cake to buy toys: go to the store, pick out the ones that seemed “fun” or “engaging” and throw it in the cart. Boy, how wrong I was. I quickly realized that all toys are not created equal. Not all good brands were as great as the advertisements claimed. Even some recommended age suggestions weren’t accurate for every kid and their individual development. The recommended age has always thrown me off, especially when I had my own little ones. It wasn’t until I was turned onto Vtech buy a friend that I started to get impressed by how spot on their toys were for each individual age. 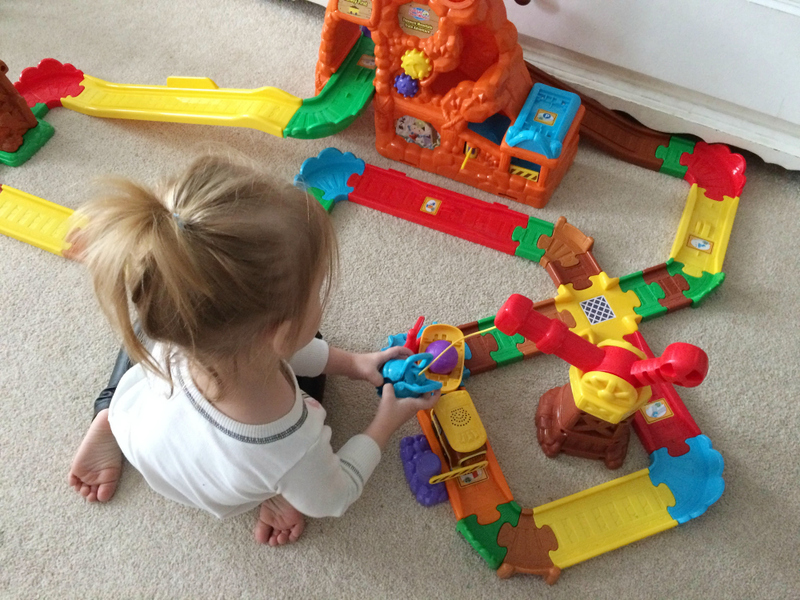 Every Vtech toy that I’ve purchased or that has been bought for my little ones as gifts, were always very engaging, educational and were geared for the appropriate age/milestones my kids were hitting. 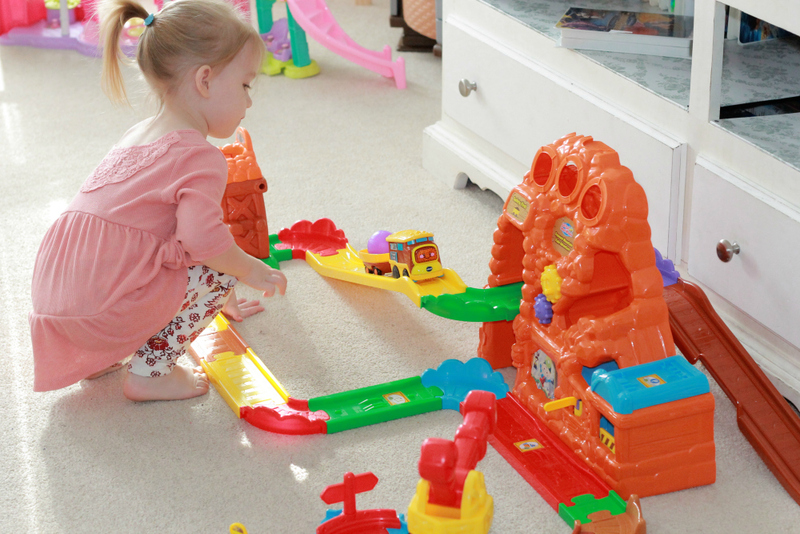 Recently I was given the opportunity to partner with Vtech to review the Vtech Go! Go! 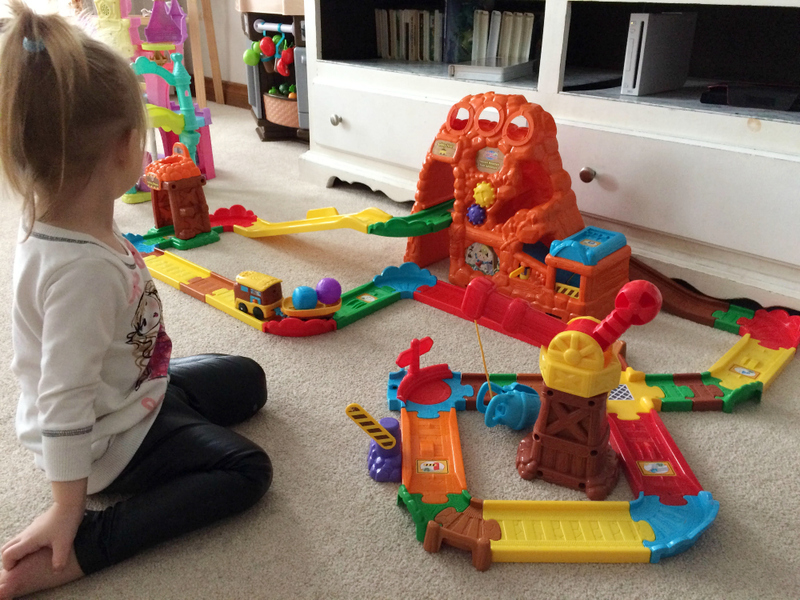 Smart Wheels Treasure Mountain Train Adventure toy. Not only was I thrilled at the partnership but, my daughter has loved her Go! Go! Smart Wheels Treasure Mountain Train Adventure. From the moment it came out of its packaging, she’s been engaged and delighted. Designed to fit the developmental learning stages of the ages between 1 and 5, the Go! Go! Train Adventure utilizes a motorized engine to make its way along the tracks, through the tunnels and over the hills. It also comes programmed with an auto-recognition system. This allows it to respond to the play sets nine SmartPoint locations that repeat fun phrases, music and more! 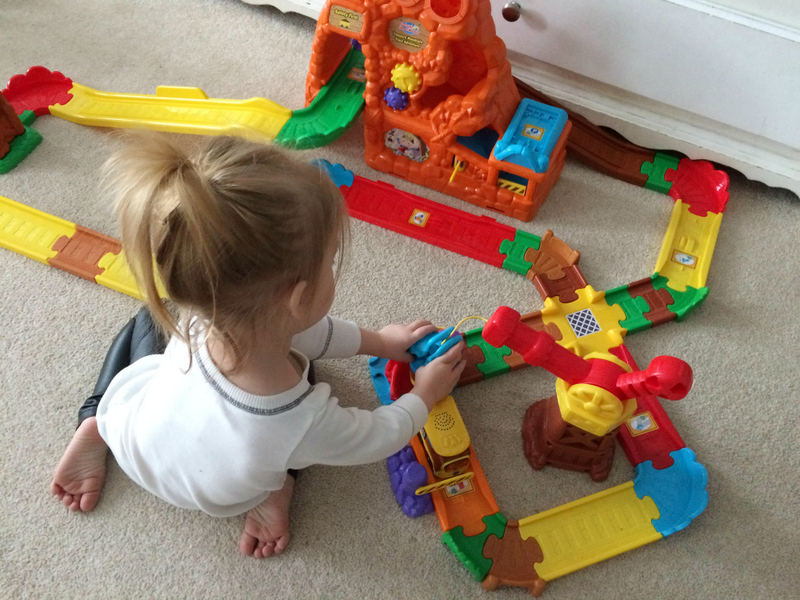 The play set, fashioned to resemble a gold mine scene, also includes real rotating gears, a crane that allows little ones to pick up and move shapes around, and a mine shaft where they can pretend to mine for gold nuggets! They’ll have hours of watching the train move on its own, be engaged by the bright colors and learn about the power of imagination as they pretend to be a prospector searching for hidden treasure in the mine! You can find Vtech Go! Go! Smart Wheels Treasure Mountain Train Adventure online at Amazon. To stay in the loop with the latest news and product releases, be sure to follow Vtech on Instagram, Facebook, Twitter, Pinterest and YouTube! Oh my goodness! How cute is that train set! Would you believe I never got one for my girls when they were little?! I wish I would have though, it’s one of those classic toys that can be kept for the next generation of kids. P.S. My godson’s birthday is coming up in a few weeks, I will most definitely be on the look out for it! I’m certain he would love it! This looks amazing. I can see all 3 of my kids enjoying playing with this. What a fun toy!